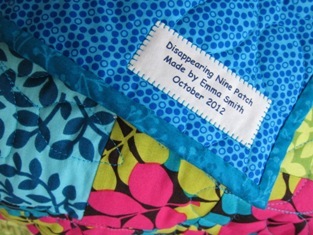 The first time I have heard the term 'Disappearing Nine Patch' was in late 2008. Without knowing what it actually was, I thought the name was rather 'odd'. Eventually, I came across the pattern in one of those craft magazines that I regularly borrow from the local library to read on the train, mostly on the way home from work. I got the fabrics for the quilt top during last year sale at Craft Depot. The process was interrupted several times, for reasons, before I finally managed to finish it. My cupboard is FULL of fabrics but, funnily, I didn't have wide enough backing fabric.! So, I made it wider with the left over fabrics from the quilt top. 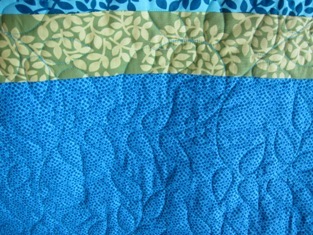 I quilted the quilt on my wonderful Gammill Statler Stitcher using 'Berry Vine Park b2b' pattern by Anne Bright. It was going to be given away as a present, but my dear 'elder' friend, Marita, told me that I must keep it for myself. Reluctantly, I did listen to her [ :-D ] AND, consequently, I had to make another quilt as the present, instead. 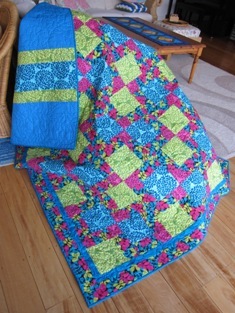 It was such a rush but I did finish the quilt and gave it away very soon after that. !